Reading has always been an important, meaningful and joyful part of my life. From the very first moment I learned how to read (very early, and I have my Mom to thank for it! ), reading has introduced me to a whole new world out there. The world of imagination, possibilities and creativity, where every book has a world of its own. I love visiting libraries and bookstores, especially during my travels. Wander between the isles of books in the unknown town or city, notice familiar titles, randomly open and read a few pages or discover new books I would like to read some day. Or wander in a charming used bookstore, find something interesting, something that looks like a piece of history and start reading. Although I love reading, sometimes it is hard to keep up with it, especially during travels, while there is a whole new world out there waiting to be explored and discovered. 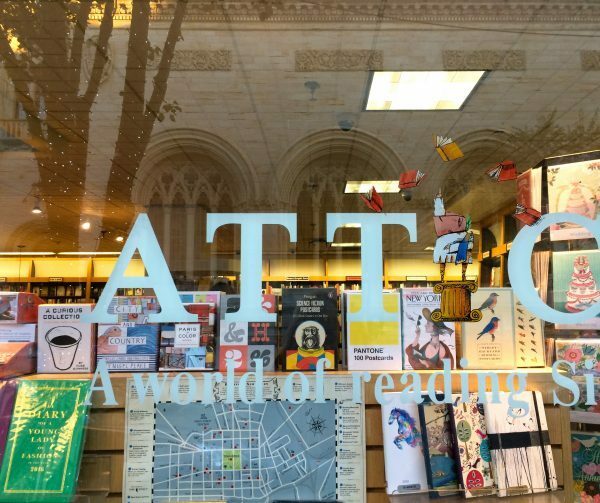 During my travels in New Haven, Connecticut I have visited more bookstores or charming cafes with books than in a few months of my travels from Vancouver to New York. Considering the amount of reading I was doing previously, during graduate school and on my own, this was my way to jumpstart something I love. Reading. 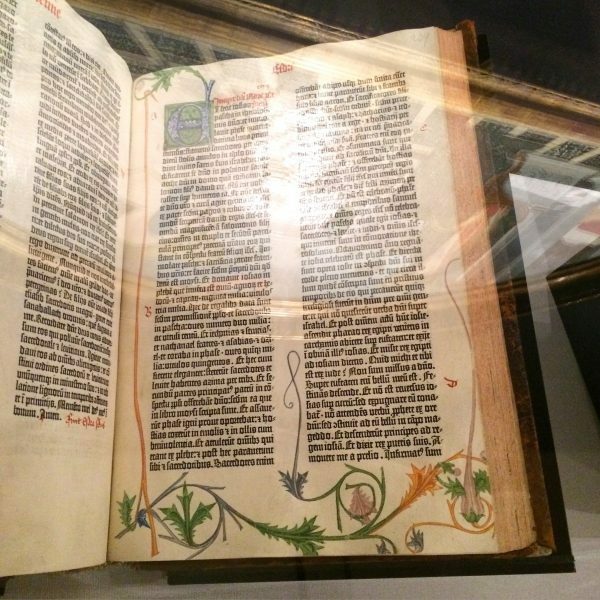 While I was exploring Yale Art Gallery, there it was Gutenberg Bible, regarded as one of the handsomest books ever produced and the first book printed from moveable type in the Western world. Dated 1454, there are only 21 complete volume sets known in the world, serving as my personal remainder of what reading has always meant for me. There I was looking at it, trying to read it, guessing its letters, drawings, meanings and words. So content to be able to recognize and understand even a few words or parts of the sentence. Recognize and understand a very meaningful part of history. The world of reading is an amazing world to experience, and it is even greater to be and feel part of history. Just as the Gutenberg Bible revolutionized the world of printing and reading, so did Kindle by revolutionizing and creating a new world of digital reading. New world of reading of its own. And as I am on my journey to start reading again, here are a few reasons why I prefer Kindle. What is great about Kindle? Compact and Convenient. As a traveler, I know that space is limited and I personally would rather use one device that has my favorites, new books and samples of the books I would like to read in the future. No need to carry bulky paper books in my luggage. Sync. Kindle app could be downloaded to your other mobile devices, such as phone or a tablet, and sync to the furthest page read, so you can switch between devices whichever in closer or more convenient for you at the moment. Although I personally prefer Kindle, since it does feel better for my eyes. Choice. With millions of titles, Kindle has a massive selection, from best-sellers, different genres, magazines to newspapers, available in Kindle version also. Most importantly, you can download and read a sample of the book before you decide to purchase it, and a definite bonus – many classic titles are available for free. Languages. As someone who speaks several languages and believes in reading books in their original language, this one is very important for me. Although I previously have been reading books in Italian and English, I was pleasantly surprised to finally see Russian books available on Kindle also. If your language is currently not available, it might be so in the near future. Built-in vocabulary. As a non-native speaker and reader, quite often I come across many unfamiliar words and expressions, so having a built-in dictionary is definitely very useful for me. Battery. Have I mentioned its incredible battery life also? It does last quite awhile and depends on the amount of reading you are doing. Very convenient for someone who travels a lot and doesn’t have an instant access to an outlet. Price. Kindle is quite affordable with prices ranging from $80 – $290, depending on the model you choose, and all the bells and whistles (from regular Kindle to loaded Kindle Voyager). Also, book prices are usually lower for Kindle version. A great plus for someone who loves reading. Do you love reading? And how do you keep up with your reading, especially during travels?